LEXINGTON, Va. Republican nominee Mitt Romney will accuse President Obama of "passive" leadership in the Middle East in what aides are calling a major foreign-policy address Monday at Virginia Military Institute. "Hope is not a strategy," he will say, according to excerpts released in advance of the late-morning address. Romney plans to call for more direct intervention in Syria, including making sure anti-government opposition forces have weapons. He also plans to criticize the Obama administration for its initial focus on an anti-Islamic video as the trigger for an attack that killed four Americans in Benghazi, Libya, including U.S. ambassador Chris Stevens. The renewed focus on foreign policy comes after several weeks of unrest in the Middle East resulting in widespread protests, attacks on multiple American embassies, and the deadly attacks in Benghzai. Romney plans to call the recent attacks "expressions of a larger struggle that is playing out across the broader Middle East" and argue for changing course in the region. Romney, who has little foreign policy experience on his resume, has been criticized for some of his previous statements on international affairs. An overseas trip he took in July was largely overshadowed by negative reaction to comments he made about England's lack of preparation for the Olympics and a perceived slight of Palestinians, whom he implied were culturally inferior to their Jewish neighbors. He took heat for an inaccurate, premature attack on the Obama administration as events were unfolding in Libya. Most recently, he offended Spanish leaders when he said in the debate that he doesn't want the U.S. to "go down the path of Spain." The VMI speech gives Romney an opportunity to make "voters comfortable with Romney as commander in chief," said Republican strategist and former McCain adviser Ford O'Connell. He pointed to a recent Gallup poll that shows Mr. Obama with higher foreign policy approval ratings than Romney and said the goal of the speech is also to "close that gap a little bit." The Obama campaign is dismissing Romney's planned speech. Obama campaign spokeswoman Jennifer Psaki says, "We are not going to be lectured by someone who's been an unmitigated disaster on foreign policy every time he sticks his toe in the foreign policy waters." She called it Romney's fourth or fifth try to explain his foreign policy goals. "The attack on our Consulate in Benghazi on September 11th, 2012 was likely the work of the same forces that attacked our homeland on September 11th, 2001. This latest assault cannot be blamed on a reprehensible video insulting Islam, despite the administration's attempts to convince us of that for so long. No, as the administration has finally conceded, these attacks were the deliberate work of terrorists who use violence to impose their dark ideology on others, especially women and girls; who are fighting to control much of the Middle East today; and who seek to wage perpetual war on the West." Romney is expected to say that he will support "the Libyan people's efforts to forge a lasting government that represents all of them," while also pursuing those who attacked the consulate. This position is the same as Mr. Obama's. On Syria, Romney plans to directly call for the United States to help arm the Syrian opposition. "In Syria, I will work with our partners to identify and organize those members of the opposition who share our values and ensure they obtain the arms they need to defeat Assad's tanks, helicopters, and fighter jets," Romney will say. Romney has previously said the U.S. needs to "be ready to take whatever action is necessary to ensure that we do not have-- any kind of weapon of mass destruction falling into the hands of terrorists," but has not yet said so specifically that he would help the opposition fighters obtain weapons. The Obama administration is providing non-lethal aid such as intelligence, and The New York Times reported that the CIA is helping allies make sure they are sending arms to fighters who are not terrorists. "I will not hesitate to impose new sanctions on Iran, and will tighten the sanctions we currently have. I will restore the permanent presence of aircraft carrier task forces in both the Eastern Mediterranean and the Gulf the region--and work with Israel to increase our military assistance and coordination," Romney will say. The Obama administration has imposed unilateral financial and energy sanctions on Iran over its nuclear program, in addition to four sets of sanctions imposed by the United Nations since 2006. The sanctions are partially responsible for the Iranian currency dropping by almost 40 percent in value in the past week and are having "significant" effects on the Iranian people, according to United Nations chief Ban Ki Moon. Romney, who just this week conceded that the Afghan surge, approved by Mr. Obama in 2009, was a success, will call for "a real and successful transition to Afghan security forces by the end of 2014." While Mr. Obama has already called for all American troops to be out of Afghanistan by the end of 2014, Romney has criticized the president for setting a public deadline and disregarding calls by some commanders to allow some troops to stay beyond that deadline. 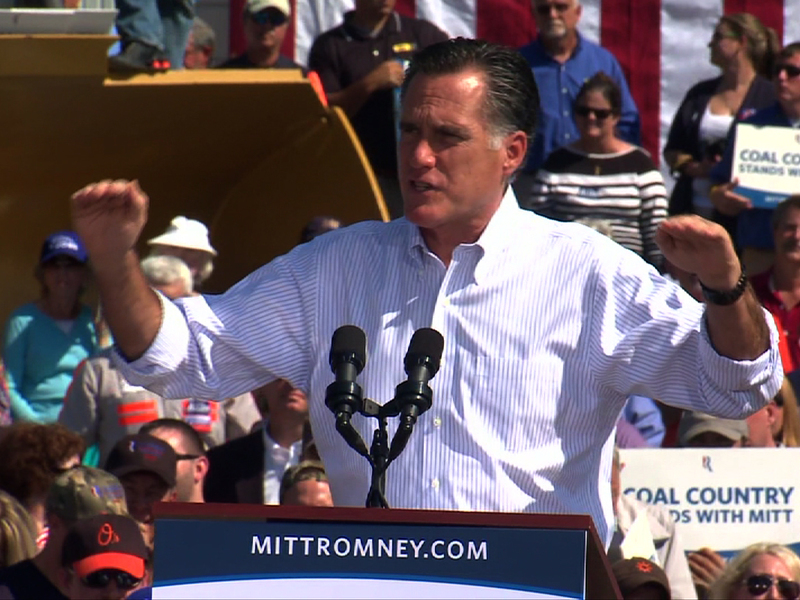 "I will evaluate conditions on the ground and weigh the best advice of our military commanders," Romney will say. "And I will affirm that my duty is not to my political prospects, but to the security of the nation." Romney plans to say that he will "recommit America to the goal of a democratic, prosperous Palestinian state living side by side in peace and security with the Jewish state of Israel." In a video of remarks at a private fundraiser that was recently released by Mother Jones magazine, Romney says he is torn by two perspectives of the conflict. On one hand he describes a view that he's "had for some time, which is that the Palestinians have no interest whatsoever in establishing peace." Romney goes onto say that in this line of thinking you have to "sort of live with it, and we kick the ball down the field and hope that ultimately, somehow, something will happen and resolve it." But he also tells the donors that he had heard from a former secretary of state who believes there is a prospect for a settlement between Israel and the Palestinians. "I always keep open the idea," he concluded in the taped remarks. Romney plans to argue at VMI that Mr. Obama has failed both Israel and Palestine, saying that "what should be a negotiation process has devolved into a series of heated disputes at the United Nations. In this old conflict, as in every challenge we face in the Middle East, only a new president will bring the chance to begin anew." Sarah Huisenga is covering the Mitt Romney campaign for CBS News and National Journal.